YOUNGISTAN: Can Mumbai escape Gayle power? In the circus that is IPL 2011, Mumbai Indians have been the trampoline artistes. They soared through the first half of the season, putting more than daylight between themselves and the rest. Then they lost steam, and began hurtling towards terra firma. At one point they even had to deal with the possibility of missing the play-offs but, almost inevitably, they bounced back with two nerve-shredding wins against Kolkata Knight Riders. Trampoline acts are fine, but can get repetitive after a while. 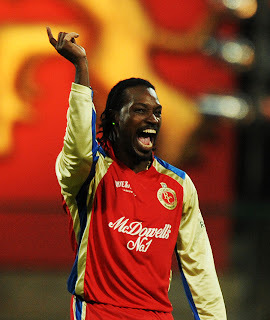 Meanwhile, Royal Challengers Bangalore have provided real entertainment in their corner of the circus, led by the ringmaster Chris Gayle. He has done everything for them - he has twirled his whip to tame the wildest bowling attacks, and he has juggled batting and bowling duties without breaking a sweat, all without losing the inimitable strut and swagger that are part of his persona. He has rarely failed to entertain this season, and Chepauk will love to be regaled one final time on Friday evening. If Gayle's still in town on Saturday, though, they won't be rooting for him. Chennai Super Kings are already in the final, and will have the crowd behind them for the big game. This virtual semi-final can best be seen through the prism of various mini-battles that will make up the contest: the battle of the tenses - the present, Tendulkar v the future, Kohli; the battle of the storms - Gayle v Blizzard; and the battle of the coloured caps - Gayle v Malinga. On a flat track, and in humid conditions that could herald a dewy night, the battle that matters most could be when the coin is spun.